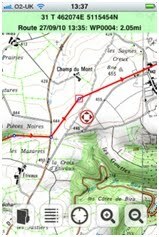 ViewRanger GPS V1.2.0 for iPhone and iPad has gone live in the Apple appstore. We introduced BuddyBeacon “sending” in the last update allowing you to share your location with friends. This allowed them to view your location via a web browser or using ViewRanger on a Symbian phone. This update takes that one step further, allowing you to view Buddy locations within ViewRanger GPS on your iPhone or iPad. You can “watch” the location of up to 10 friends, who have enabled BuddyBeacon and given you their PIN code. A dotted track is displayed showing their recent progress. This software update also introduces compatibility with the Retrieva Tracking GPS tracking dog collar. For more information go to www.retrievatracking.com. 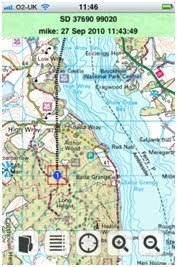 Whilst in previous ViewRanger GPS versions you have been able to create, import or download routes with waypoints. It has not been possible to be navigated along that route – version V1.2.0 addresses this. This upgrade means that the app will allow you to follow a route. An arrow is shown indicating the direction to go, with optional waypoint alerts and even alarms if you veer too far off-route (XTE alarm). The feature also allows you to navigate to a point of interest (POI), or even to a watched BuddyBeacon. Another aspect of the new navigation capabilities is that routes with Audio/Video content such as the “Hadrians Wall walk” are now fully supported with the audio & video content being GPS-triggered at the appropriate waypoints. Finally, in response to user feedback, we have introduced an edit-handle for POIs and Waypoints, so that your finger doesn't obscure the map when dragging POIs and waypoints. We hope that you enjoy these new features.